WHAT IS YOUR BANK'S RISK PROFILE? The Seifried & Brew Total Risk Index ("S&B Risk Index") predicted 99% of banks that failed during the Great Recession! What is your S&B Risk Index saying? 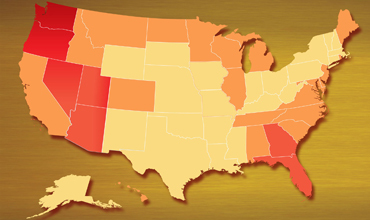 Access your institution's S&B Risk Index by viewing our interactive map. Or, purchase your full report to view a comprehensive breakdown of the risk components that make up your bank's S&B Risk Index. After the Great Recession, the regulators will require directors and management to have a thorough understanding of risk. The Seifried & Brew Total Risk Index ("S&B Risk Index") is an independent method of risk assessment that has as its foundation the critical elements used by the regulators to evaluate the health of a financial institution. More importantly, it allows directors and management to be proactive in managing risk. Credit risk, earnings at risk, liquidity risk and capital risk are the foundation of the proprietary S&B Risk Index. As such, the various risks in the S&B Risk Index are weighted based on S&B's 30+ years of risk experience. In addition, the S&B Risk Index also incorporates an economic component that recalibrates a community bank's risk based on changes in the national and regional economies. The Seifried & Brew Total Risk Index is indicative of risk, but there may be circumstances that mitigate our risk findings. At S&B we believe that your directors and management should use this as an independent tool to delve deeper into your bank's risk profile. We believe this will promote discussion and action. The subscription to the Seifried & Brew Performance Risk Report ("S&B PRR") is available to quantify all the components of our risk assessment and shed light on the particular risks to your institution, as well as important performance comparisons with your peers. Read the book How The Seifried & Brew Total Risk Index Predicted 99% of Failed Banks.